Just when you thought there couldn’t be any more spin-offs to Jenga, along comes Kerplunk. 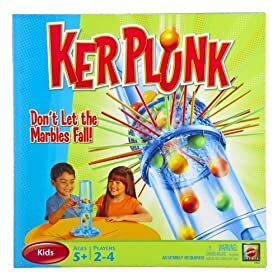 The aim of the game is to remove plastic support sticks turn by turn, but avoid the dreadful “Kerplunk!” sound that occurs when you lose some marbles (in the game, that is!). While the assembly of the Kerplunk game can be lengthy for what it is, it’s relatively simple both in setup and gameplay. Connect the two plastic tubes and take turns crisscrossing the little red support beams at random. Then carefully drop the provided marbles on top of these beams, and assign each player a marble tray. Now you’re good to go! The first player slowly shifts the gaming device so that the marble evacuation shoot is pointing at his personal compartment. Doing this at the beginning of every turn ensures that any marbles that are dropped will go to their proper owner, whoever was responsible for upsetting them.On his turn, a player must choose ONE stick, the first stick he picks, to guide out of the tube. The player is allowed to steady the game base with one hand as he pulls, ultimately trying to disrupt as few of the marbles as possible. Falling marbles cease to be counted against a person when the next player makes a grab for a stick. Play proceeds around the table, with each contender collecting his lot of unwelcome marbles. The game ends once all the marbles have dropped, and it is the participant with the steadiest hands (least marbles) who wins. Try not to poke whoever lost with one of the game sticks. Kerplunk is a simple game of skill that was especially popular in the 60s and 70s. It may be the same basic idea each time you play, but watching some sucker drop the whole marble lot on his turn never ceases being hilarious. The instructions come in three languages, so there’s really no language barrier to play. The Kerplunk game is a bit of a pain to set up, considering how short the game play is. There are lots of little pieces, so keep it away from your baby and dog. It also has the potential to break if the sticks are being jammed or if you drop or sit on one of the tubes. Overall, Kerplunk is a good game that will amuse nearly all walks of life. The set up vs. actual game time and noise might detract some, though. I had Kerplunk when I was a kid in the mid sixties. Jul 23, 2009 THIS GAME ROCKS! Kerplunk has been around longer then Jenga so it couldn’t be a spin off of Jenga. Rather maybe vice versa? My grandmother had this game for my Dad and his siblings when they were growing up. Fond memories of playing Kerplunk in the basement at Grandma’s house…..when there was nothing else to do! Ahhhh the good old days! !